Mark Gillett has been recruited to capture on camera Georgios’ Marathon des Sables efforts in his pursuit of completing the Ice Water Fire project. Mark is the creator of SuitCase Media & Productions and has an extensive, and impressive, background in filming and photography. Mark’s collaboration with Georgios is expected to create breathtaking images and inspiring videos. 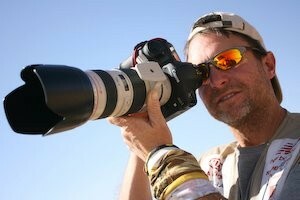 Mark is no stranger to the Marathon de Sables; he has photographed the Marathon des Sables on a number of occasions, while further, a runner himself he has previously successfully completed the run as well! He will be joined in this venture by his trusted collaborator Sam Clough. Mark has a lifelong expedition history from the deserts of Africa and the Middle East, to the Amazonian jungle and even the freezing climes of the Yukon Arctic. He has delivered images and text to national publications such as Sunday Times, Telegraph Magazine, CNN Traveller, Geographical, Digital Photographer, Practical Photographer, Dazed & Confused, Runners World, Running Fitness, The London Paper, Observer, Ultra Fondus, Outer Edge in Australia, Adventure Sports Magazine, Camouflage, Daily Telegraph, Telegraph online, Guardian, The Army, Aston Martin, El Mundo, and numerous small press. 3 weeks to the start of the Marathon des Sables!